If you haven’t heard already — the news is at least 12 hours old at this point — the ACS competition winners have been announced. Congrats to everyone! I’ll write up my usual full account of the judging when I get back to town but it was awesome. List of all the winners here. It’s always an amazing moment at the awards ceremony when it is time for Best of Show. I like to sit in the front row so that people can’t see that I always cry when the award is announced. An incredibly loud “OH MY GOD!” came from the back of the audience when this name went up on the screen… and I just couldn’t help myself. Congratulations on all the hard work. Still, I knew this cheese would be popular when I physically bumped into Marianne Smukowski in front of a bandage-wrapped mixed milk cheese while trying to get a second taste. We didn’t say anything then, but in the waiting room after we had turned in our ballots she asked me if I voted for it and I said yes. When some other folks chimed in as well, I knew that it would be recognized. That is the weird thing in the judging room. I usually think I will be the only one voting for the cheeses I select. Before I turn in my sheet I always say to myself, “Even if no one else votes for these cheeses, will you be proud of your decision?” When my answer is yes, I know I am ready to vote. The Flagsheep we tasted was awesome and truly deserved this honor. A sheep/cow bandaged-wrapped Cheddar with a ton of complexity: sharp, sweet, nutty, grassy… just amazing. When I tasted it against the other 10-12 cheeses in my informal top tier ranking, I knew I would vote for it as my top aged cheese. I just wish I could get my hands on some now that the show is over. Word is that they only had 23 wheels aged and ready to go and that they were all allotted. 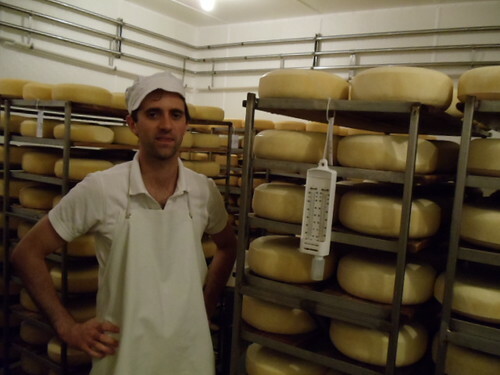 Here is their happy cheesemaker. *Most of you will be relieved, and only a few sickos disappointed, that the picture of my spit bucket was too overflashed to bother posting here. Hopefully they will ask me to judge again next year so I can get a good one. 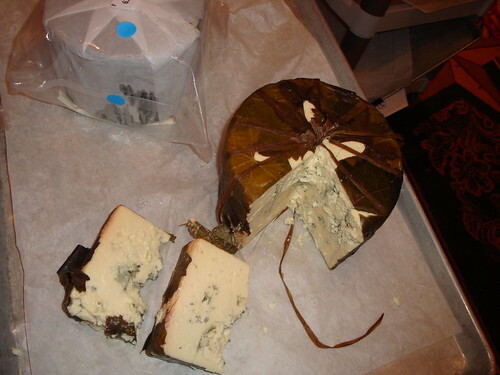 So, with the results of the American Cheese Society Competition coming through, it would be impossible not to name Rogue River Blue as a Cheese of the Week. 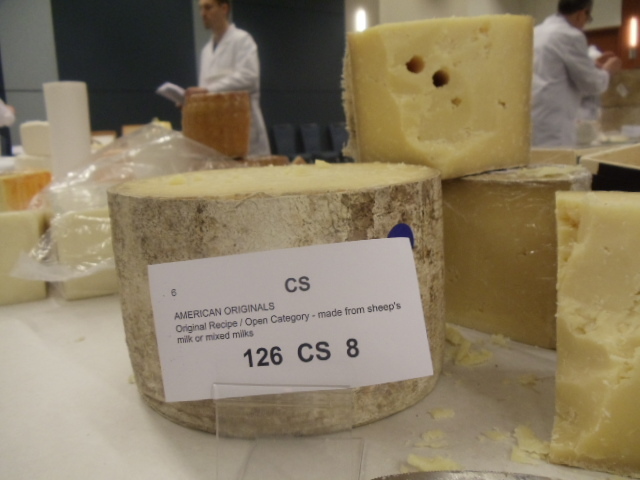 Rogue River just became only the second cheese to win the ACS Best of Show (Pleasant Ridge Reserve has won three times) and, while variety of winners is nice, this cheese is one of the elite American cheeses. It could be named Best of Show every year and it would be hard to squawk about it. Seasonally made, wrapped in pear brandy-soaked grape leaves, Rogue River Blue is simply a tremendous cheese: Raw milk, sweet, earthy, fruity, grassy, rich and with a perfectly balanced amount of bluing. 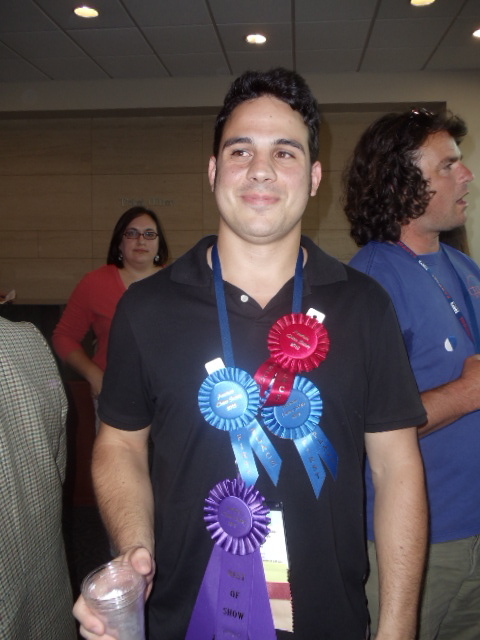 It’s just amazing; a cheese that you taste and say, “Now I get why people go crazy about cheese.” I was a judge when Rogue River won the first time so – since I wasn’t in Montreal this year – here’s the post I made about that year’s awards ceremony. Also, it’s a wonderful tribute to Ig Vella’s continuing influence that this wonderful cheese won best of show again. My other cheese of the week is one that we almost always carry. 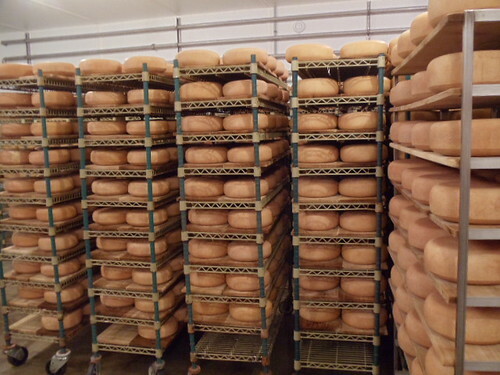 It sells steadily and many people know it well so we don’t push it as much as other, less established cheeses. However, I had a distributor call me with one of those OMG-we-have-too-many-cases-of-this-and-they-are-about-to-expire phone calls so I bought about four times as much as we usually get. We all know that – much of the time — a distributor’s “about to expire” is a cheesemonger’s “almost perfectly ripe”. This cheese can get neglected because Bonne Bouche – its sister cheese made by the same company – is stronger, creamier and demands more attention. But the Coupole is just as good in a quieter way. Tangy, lactic, earthy and substantial. It’s a classic ripened goat cheese in a French style (think round mini Bucheron – but with the ropey geotrichum mold that makes it look like a little brain), one of the best examples of its style available in this country. I sampled this out all day on Saturday and heard nothing but love. Sometimes — when you work with cheese all the time – you have to take time to remember the cheese that kind of sells itself. Hi Coupole. Sorry if you felt unappreciated. You’re awesome and I really like you. I’m sorry I took you for granted. Here is a pantheon of great cheese in the back of our rental car in 2006. (L-r: Franklin’s Teleme, Bonne Bouche, Coupole, and Bijou) I forgot that the Coupole was originally ashed on the outside! The amazing thing about Wisconsin Cheesemakers is that there are so many great ones close together. The morning after the Gathering of the Cheddar Makers, I headed a half hour down the road to visit Uplands Cheese. Uplands is famous for being the only company to win the American Cheese Society Competition Best of Show more than once for the same cheese. Pleasant Ridge reserve has won three times, most recently last year. Long time cheesemaker/owner Mike Gingrich is in the process of turning over the operation to Andy Hatch but the cheese is as good as ever. Last year Uplands introduced their second cheese: the seasonal Rush Creek, a Vacherin Mont D’or-like, bark-wrapped, oozy bit of amazing. Unrelated to cheesemaking, Andy used to live directly below the infinity room* at House on the Rock. No one seemed happy when I brought up the proximity of Uplands and HOTR. C’mon dudes, embrace your culture! ** Even if they are unwilling to acknowledge the camp-terroir of their region, the Uplands folks make great cheese. 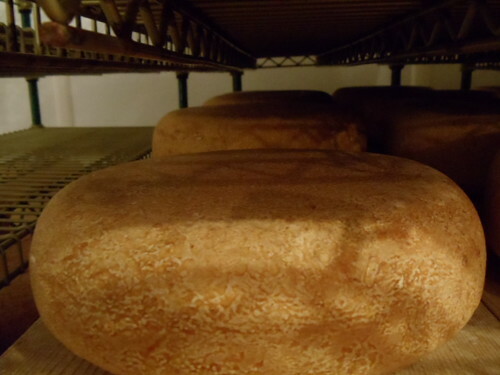 The Pleasant Ridge is Alpine style, nutty and grassy, more like a well-aged Comte than a Gruyere. Like Comte, it’s dry-salted instead of brined and it’s one of this country’s best full-flavored big cheeses. 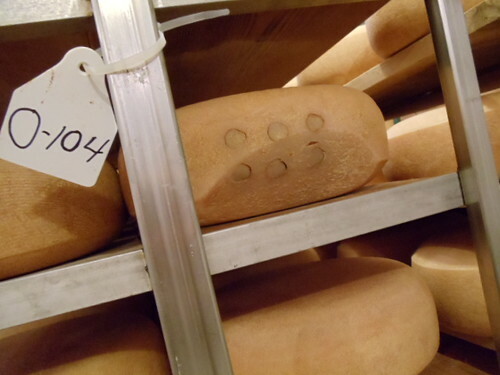 Being a grass-based operation, Uplands does not make cheese year-round and they sell all the cheese they make so, while not rare, you won’t find it everywhere. 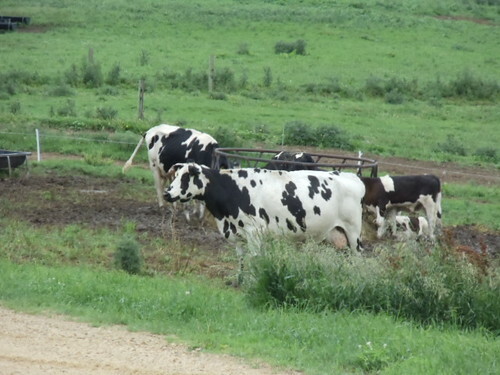 Lastly, Uplands Cheese is farmstead, meaning that all the milk comes from their own grass-based cows. Aren’t they cute? 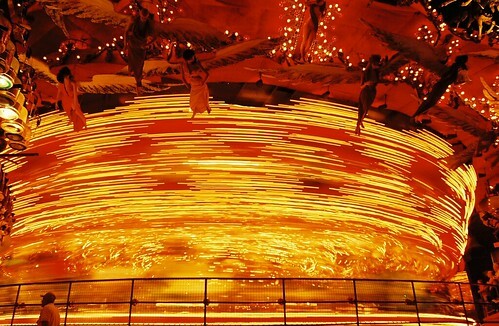 *The Infinity Room really is awesome.